Its amazing that I even need to write a piece of this – but so be it, lets put the record straight, mark a line in the sand and re-establish exactly what Remote viewing is for those who have lost their way. Anything psychic, any kind of intuitive impression be it clairvoyant, from tools like tarot cards, even channelled information, but more often than not its handwritten impressions, sketches and words on sheets of paper. BUT and yes there is a BUT to this. The act of Remote Viewing is defined by how it’s done. SRI (Stanford Research Institute) was required to create a set of rule or protocols to both define what remote viewing was and to also make it scientifically testable. Planned and Aimed. The psychic session must be planned and done on purpose. If you get a “spontaneous insight” or have a dream, that is not Remote Viewing. RV is when you intend to collect information about a specific target. Remote viewing is the ability to produce information that is correct about a place, event, person, object or concept which is located somewhere else in time and space, and which is completely blind to the remote viewer and others taking part in the process of collecting the information. All persons present during a remote viewing should essentially be blind to the target. There should be some form or means of validating the material after the remote viewing has been accomplished. In other words there should e feedback of some kind. Those who throw something together and call it remote viewing do a disservice to these people, these labs and dilute the very value and significance that these studies have brought to the paranormal field. So regardless how you might be trained, when you agree applying remote viewing, the target should be blind to whomever in the room”. Remote Viewing Secrets – pages, 22-23, 268. “Remote Viewing is composed of a five part protocol, and when any one of the five parts are omitted (such as confirmatory feedback), then what has taken place is something other than remote viewing….. Fate article – On remote viewing UFOS and extraterrestrials September 1993. 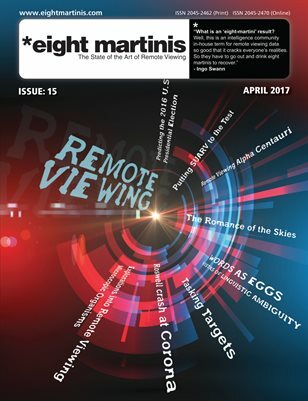 So, if you encounter anyone claiming to be a remote viewer and/or remote viewing and yet you find that these protocols have been disregarded, then firstly they have not been remote viewing and secondly, be very careful what you decide based on this material as there is no way to assess its accuracy or validity. To be honest most long time practitioners in the field of remote viewing should know and abide by these defining rules, but alas some don’t.